Tecno Spark 3 is the new latest affordable smartphone in the Nigeria market. The phone is rocking a pleasant body design that has a wide notch and a large screen display size. It’s selling almost in the same price segment with the Huawei Y7 Prime 2019. Both phones are now available in Nigeria and other African countries that include Kenyan, Ghana, Uganda, and Tanzania. Below, we will be making a comparison between the Tecno Spark 3 and the Huawei Y7 Prime 2019. In terms of body design, both phones come with a modern body. Although they are built with plastic, however, the Huawei Y7 Prime looks more premium than it’s rival. On the back, they house a combo rear camera with an LED flash and a fingerprint sensor for security. Shifting to the front area, you will notice that the Spark 3 has a wide notch, while the Huawei Y7 Prime has a waterdrop notch. Both have a small bezel on the bottom of the screen and they have onscreen navigation buttons as well. You can order any of the phones in multiple colors. On the display, the Spark 3 and the Y7 Prime features almost the same. They have the same screen display size of 6.26 inches under IPS display technology with a similar screen resolution of 720 ×1520 pixels. They also pack the trending 19:9 aspect ratio and they have display protection as well. Huawei Y9 2019 VS Tecno Camon 11 Pro: Which One Should You Buy? 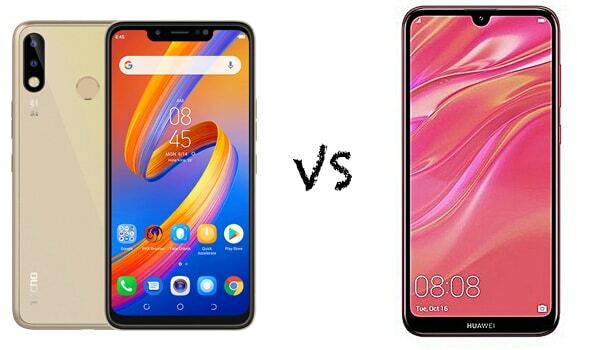 TECNO CAMON 11 VS Huawei Y9 2019: Did TECNO Copy Huawei Y9 2019? Even on the camera department, both phones pack similar rear camera configuration. They have the same combo rear cameras of 13MP + 2MP paired with dual LED flash. It’s only on the front that they differ. The Spark 3 has an 8MP front camera, while the Y7 Prime has 16MP up front. So the Y7 Prime has the point on the camera aspect. On the hardware, the Spark 3 has MediaTek MT6761 Helio A22 chipset with Quad-Core 2.0GHz processor, while the Huawei Y7 Prime 2019 has Snapdragon 450 chipset with an octa-core processor that clocked at 1.8 GHz. The Spark 3 has 2GB RAM with an inbuilt storage of 16GB which is expandable while the Huawei Y7 Prime has 3GB RAM with an internal memory of 32GB which is expandable as well. The spark 3 runs on Android 9.0 Pie, while the Huawei Y7 Prime runs on Android 8.1 Oreo operating system. It’s only the Huawei Y7 Prime that has support for 4G LTE network. The Tecno Spark 3 has a nonremovable battery capacity of 3500 mAh, while the Huawei Y7 Prime has a bigger battery capacity of 4000 mAh. On the price, the Spark 3 will sell at a price of $89, while the Huawei Y7 Prime 2019 will sell at a price of $119. On the overall, the Huawei Y7 Prime has the point. The phone wins with a better body design, good camera set-up, enough inbuilt memory, and bigger battery capacity. So it will make a wise buy, while the Spark 3 will make a good alternative.